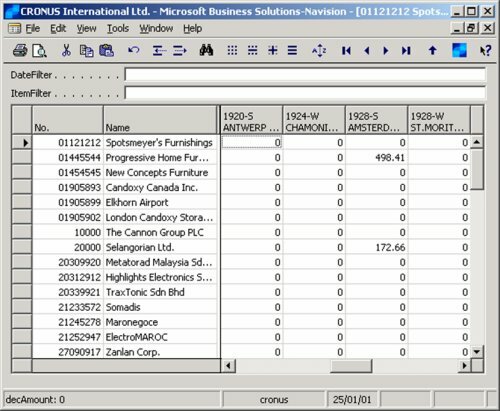 The first form (Form 50000) describes how to create a matrix-box from scratch (the matrix shows the amount for the items (and which items) a customer has bought during a certain time period. The steps are described in the Documentation-section of the form and also in this How To. 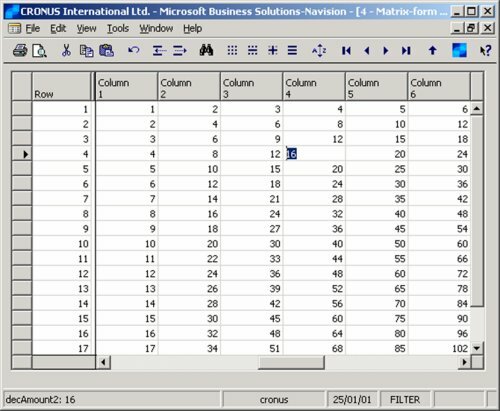 The second form (Form 50001) is an example on how a matrix box is used to show/edit a 2-dimensional array (the documentation-section contains a description where some code has been put and which properties have been changed). • Property : "Source Table"
Implement now Functions "MakeLabel" and "GetData"
a row-field). Hit CTRL+F7. Now you can put filters on the table that is used to define the columns.